There is a political cartoon of Kennedy arm wrestling Khrushchev, and they are both sitting on hydrogen bombs. I would like to know who drew that, when it was drawn, and where was it first seen. Welsh-born cartoonist Leslie Gilbert Illingworth drew the famous cartoon of John F. Kennedy and Soviet Premier Nikita Khrushchev arm wrestling while sitting on hydrogen bombs. It appeared in the October 29, 1962 edition of the British newspaper The Daily Mail. Born in 1902, Illingworth started drawing cartoons for the famous British news magazine Punch in 1927. The Daily Mail hired him as well in 1937 and he continued to provide cartoons for both publications for the rest of his career. He gained a measure of national fame for the effective cartoons he drew during England's dogged stand against Nazi Germany. Illingworth was not an overtly political cartoonist and this is evident in this arm wrestling cartoon. One notices the characteristic Illingworth preference for detail rather than commentary on who is right or wrong. The intensity of the struggle is captured both by the energy that radiates out of Kennedy and Khrushchev's gripped hands, but also by the fact that each is sweating profusely. Each man still has his finger on the button that will detonate the bombs. Illingworth's cartoon reminded readers that the superpower struggle would continue and that the possibility of nuclear annihilation remained. Illingworth's drawings contrast sharply with those of Edmund Valtman, the Pulitzer Prize-winning and fiercely anti-communist cartoonist for The Hartford Times. 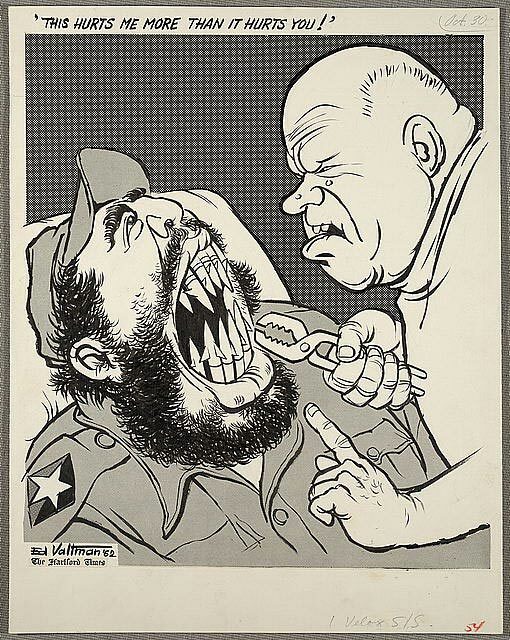 On October 30, after the crisis had seemingly passed, his paper published a Valtman cartoon of Khrushchev yanking missile-shaped teeth out of a hideous-looking Castro's mouth. The caption above the illustration reads, “This Hurts Me More Than It Hurts You” and the cartoon clearly represents a moment of American gloating over the communists. That the Illingworth cartoon was published in a British newspaper bears witness to the fact that the outcome of the Cuban Missile Crisis affected the fate of populations beyond those of the United States and the Soviet Union. Indeed the whole world was watching. The publication date of October 29 is also significant since on October 28, Khrushchev announced that he was withdrawing the missiles out of Cuba and the crisis seemingly had passed. Illingworth's cartoon reminded readers that the superpower struggle would continue and that the possibility of nuclear annihilation remained. Gaddis, John Lewis. The Cold War: A New History. New York: The Penguin Group, 2005. Frankel, Max. High Noon in the Cold War: Kennedy, Khrushchev, and the Cuban Missile Crisis. New York: Presidio Press, 2004. Library of Congress. "Prints and Photographs Collection Online Catalog." Accessed January 2011. Taubman, William. Khrushchev: The Man and His Era. New York: W. W. Norton & Company, 2004. University of Kent. "British Cartoon Archive, Illingsworth Collection" Accessed January 2011. Dobbs, Michael. One Minute to Midnight: Kennedy, Khrushchev, and Castro on the Brink of Nuclear War. New York: Vintage Books, 2008. Kennedy, Robert F. Thirteen Days. New York: W.W. Norton & Company, 1999. Illingsworth, Leslie Gilbert. "Kennedy/Khrushchev". The Daily Mail, October 29, 1962. Accessed January 2011. Valtman, Edmund. "This hurts me more than it hurts you." The Hartford Times, October 30, 1962. Accessed January 2011.